High-end upholstery business Kingcome Sofas posted double-digit growth in first half sales after it delivered its strong order book going into the period. Javier Quiñones, appointed IKEA UK and Ireland country manager last summer, has been named as the successor to the head of the global retailer's operation in the USA in a move that has implications for its British-based business. Parliamentarians lauded the contribution of Britain's furniture manufacturing industry on the economy and debated issues impacting the sector in a Westminster Hall debate last week. Maggie Throup MP, says Long Eaton sofa manufacturers that may be displaced by High Speed 2 (HS2) need to be financially supported. Upholstery companies in Long Eaton that face being railroaded out of their factories by High Speed 2 (HS2) routing need assurances over their future and must be allowed to relocate within the strategically-important NG10 postcode area. Challenging market conditions prompted a double-digit fall in sales for Asiatic Carpets, one of Britain's largest rug distributors, in the year to March 31, 2018. National beds specialist Dreams says it will make the Eve mattress line available on its website again with both parties currently in discussions over the commercial terms of their partnership. Decorative Panels Furniture, the West Yorkshire ready-to-assemble furniture kit maker, returned to sales growth in 2017–18 after a decline the previous year. The state is the biggest creditor of B&S Upholstery, the South Coast sofa maker that traded as Billy & Slouch and additionally supplied household names with upholstery on a white-label basis. Ecommerce and mail-order retailer Studio posted double-digit sales growth in the final three months of 2018 while home goods have gained traction in the early weeks of this year. Channel 4 has agreed to take equity in mattress and ancillary products brand Eve Sleep in lieu of payments for television advertising spend with the broadcaster. IKEA, the world's biggest furniture retailer, will this spring open a first city-centre store in the French capital as it continues to experiment with reimagined store formats. Lisa Broad, in her second week at Ashley Manor after leaving national furniture retailer Harveys, says the switch to manufacturing will enable her to pursue her passion for upholstery. Upholstery business Alexander & James is to open a showroom in Bangkok, Thailand, as the British brand boosts its international presence in the Far East. Department store chain House of Fraser has walked back a decision to close four shopping centre stores after cutting a deal with Intu, the retail property company. Phil Reynolds, director at the Furniture Industry Research Association, is pictured on the right of each picture with ACL 2002's Danielle Watts and Mobus' Ian Bostock. Sofa maker ACL 2002 and fabrics supplier Mobus have achieved Certified Company status under the Furniture Industry Research Association Compliance Scheme for the Fire Performance of Upholstered Furniture. John Lewis & Partners has announced the planned closure of Knight & Lee in Southsea, the smallest full line shop in the department store chain's estate. David Payling, the longtime DFS executive who joined Furniture Village this week, says sales are his main strength and he can help the 52-store national retailer drive top line growth. Hartman UK, known for its outdoor furniture ranges, has entered the indoor furniture category for the first time with launches made at the January Furniture Show this week. G Plan cabinet ranges will hit British retail shop floors this summer for the first time since Sofa Brands International reacquired the brand rights to case goods back in 2015. Upholstery market leader DFS has extended the breadth of its Joules-branded upholstery series, as well as launching a new product into the collection. Home goods were down for the second straight week at John Lewis & Partners as the department store chain relied on fashion lines to inch ahead of last year overall. Furniture wholesaler Content by Terence Conran swung back to profit in 2017–18 as wider gross margin offset the impact of falling sales. The Beter Bed group, operator of formats including Matratzen Concord, said back in 2017 it had seen reduced footfall as a result of foam supply issues. Beter Bed Holding, the multi-format mattress retailer with over 1,000 stores across Europe, is taking legal action against the chemicals giant that was at the centre of foam supply issues back in 2017. British case goods importers shipped in fewer goods ahead of peak Christmas trading with falls from all bar one of the leading source nations. "We're probably the biggest furniture manufacturer you've never heard of," says Mark Dolder, md of a North East seating company launching into the retail market with the introduction of the Ayla brand this week. John Lewis & Partners operations director Dino Rocos is to leave after 43 years with the department store retailer. He will retire at the end of May 2019. Hastings sofa maker B&S Upholstery is to be liquidated a little over a year after it emerged from the embers of what was once one of Britain's busiest upholstery factories. Flex, the £300 million bedding group that owns And So To Bed and Vispring, has agreed to buy Canadian bed maker Marshall Mattress from its private shareholders. Judges named the winners of The Furniture Awards at the NEC today (Jan. 20) with Parker Knoll — celebrating its 150th year in 2019 — among the winners. Upholstery chain Sofology has further reshaped its management team with one of the industry's best-known buyers returning to the business in a more senior role. Embattled department store retailer Debenhams has begun talks with landlords with a view to cutting its rent bill, according to the Financial Times. European furniture etailer Home24 said a record Black Friday event meant it hit full year order targets in 2018 but revenue will be lower than forecast after some deliveries were delayed until January. Beds and furniture group Airsprung has invested £250,000 acquiring new machinery for its Cavendish Upholstery and Swanglen business units, underscoring its commitment to the upholstery and headboard sectors. Who would buy Sofa.com and how much would they have to pay? When Sofa.com debt-holder LGT European Capital took over the equity element of the upholstery vertical last year there was perhaps only ever one certainty. Direct-to-consumer mattress business Emma says it racked up nearly £10 million in sales in the UK in the fourth quarter of 2018, with one of its co-founders forecasting consolidation in the sector in the near-term. Third quarter product sales fell for the company behind the home shopping retailers JD Williams, Simply Be and Jacamo, but the overall revenue fall was lower because of extra income from financial services. 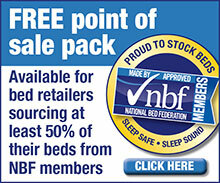 The National Bed Federation (NBF) is calling on companies across the beds supply chain to participate in a survey that will inform future planning policy with regard to used mattresses and improving recycling rates. John Lewis & Partners sold more big-ticket goods like furniture and floorcoverings last week as overall sales across the department store chain inched forward on an annual basis. Italian upholstery giant Natuzzi will roll out more dedicated Natuzzi Editions stores in Britain by the spring as it follows the launch of the first two units here on Boxing Day. Ercol, the British furniture maker that celebrates its centenary next year, has added a second international showroom with a permanent display at Design Post in Cologne, Germany. Marks & Spencer is closing stores, envisaging more of its clothing and home business being conducted online in the future. Retail giant Marks & Spencer has disclosed a further 17 towns and cities where stores are earmarked for closure, part of its ongoing programme to downsize its physical shop presence. Ecommerce home furnishings giant Wayfair will add around 200 new jobs in Lutterworth with its move to a larger distribution centre on the edge of the Leicestershire town. The value of mattresses imported into Britain in November 2018 was higher than any other month in history, new figures show. ACL 2002, a West Midlands sofa maker supplying retailers including ScS, achieved record sales for the third consecutive year in 2017–18. Profits fell because of rising costs. Shop Direct, the ecommerce giant behind the Very.co.uk and Littlewoods.com brands, said its furniture and homeware category returned to growth over the festive season. Department store retailer House of Fraser has closed its store at Shrewsbury for the final time as new owners continue to reconfigure the retailer's portfolio. Britain's retailers and wholesalers upped upholstery stocks ahead of the festive season with Chinese and Italian products behind the bulk of the uplift. Tempur Sealy International has agreed to provide debtor-in-possession finance to one of its major customers in the U.S after the retailer filed for Chapter 11 bankruptcy protection. Fewer shoppers ventured into UK stores in December — a thirteenth straight year-on-year slide — but the fall was softer than feared, according to new figures. New product line consists wholly of reusable materials, European mattress maker says ahead of launch. Macdonald Inchyra Hotel & Spa at Polmont will host the February 19–20, 2019 event, which takes in products spanning fabrics, wallcoverings, furniture, lighting, flooring and accessories. The 12th edition of the Scottish Interiors Showcase, which brings together 80 suppliers representing 150 leading interior design brands, is scheduled to take place next month. Independent furniture retailer NCF Furnishings says it will return to growth in 2018–19, after reconfiguring its store network and investing heavily in stock depleted sales and cash last year. Godfrey Syrett, the circa £29 million North East furniture maker specialised in serving contract clients, has been placed into administration and ceased trading. Furniture makers that are concerned about the potential impact of a disorderly departure from the European Union should be taking preparatory action now, according to the lead trade association representing UK manufacturers.